STILL OF THE NIGHT is a well-intended but unsuccessful 1982 attempt to create a Hitchcockian suspenser. A psychiatrist becomes involved with the girlfriend of a former patient, whose murder may/may not have been caused by the lady. Fair writing (some plot hole problems) by Robert Benton but direction (also by Benton) fails to wring much tension out of the situations, and the characters elicit little empathy or sympathy, even as played by two strong actors. 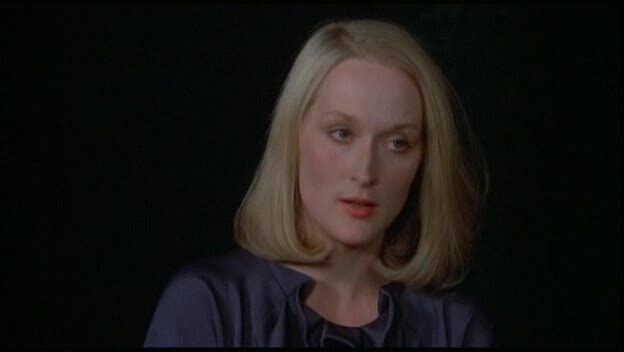 Roy Scheider sleepwalks through the shrink role; Meryl Streep gives more guts to the femme, but her laudable pro efforts are not enough to lift the movie out of second gear. Well photographed (Nestor Almendros), easy on the gore, but the end result of the 91 minutes is pretty much a shrug. Moneywise, it only got to 84th place for the year. With Jessica Tandy, Joe Grifasi, Sara Botsford, Josef Sommer. The film references at least eight Hitchcock movies by way of homage, but all that accomplishes is gimmick. Stick with Master Alfred.